The LabotronTM AMW 100, 915 MHz, 5 kW microwave oven and LabotronTM RF 3000 27.12 MHz, 50 ohm, max. 3 kW RF oven have been conceived to have very homogeneous distribution of energy in the product to be treated. LabotronTM RF 3000 is the only RF oven that allows the accurate measurement of the absorbed power by the product. With its automatic tuner and full instrumentation, the LabotronTM allows the optimization of the absorbed power, the evolution of the dielectric properties of the heated product during treatment and the storage/export of all setting points recorded during the treatment. 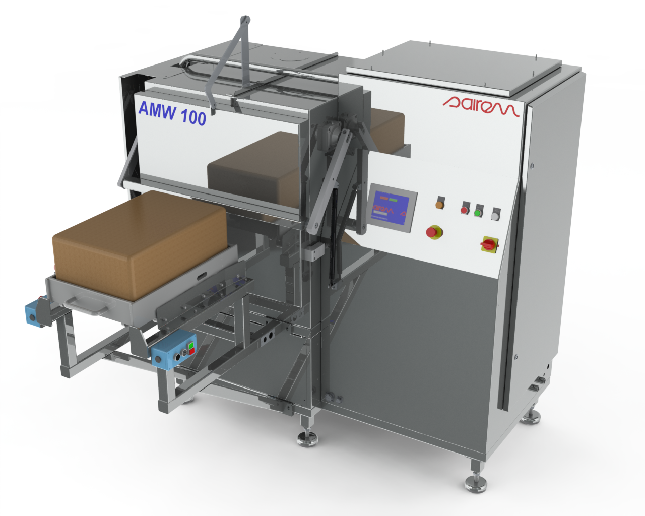 The distinctive feature of Sairem’s LabotronTM AMW 100 is the use of a sliding table & door making easier loading/unloading of 1 block and its microwave coupling from the top and bottom of the product as well as the rotation of a turntable, which substantially improves the homogeneity of treatment. SAIREM can offer advice on choosing the oven adapted to your needs; special configurations are also available upon request. SAIREM’s R & D team will be happy to help developing equipment specific to your application.